Sustainability matters. It’s important to growers, retailers, consumers and other key stakeholders throughout the food and agriculture value chain from farm to fork. At Agrinos, our commitment to sustainability drives us to harness new technologies that capture the power of naturally-occurring microorganisms and nutrients that enhance the soil microbiome and promote plant health. We develop crop inputs that deliver tangible environmental benefits as well as meaningful financial returns to our customers. Our products can enhance crop health and quality, and empower growers to improve soil health, water quality, nutrient efficiency and overall land stewardship. 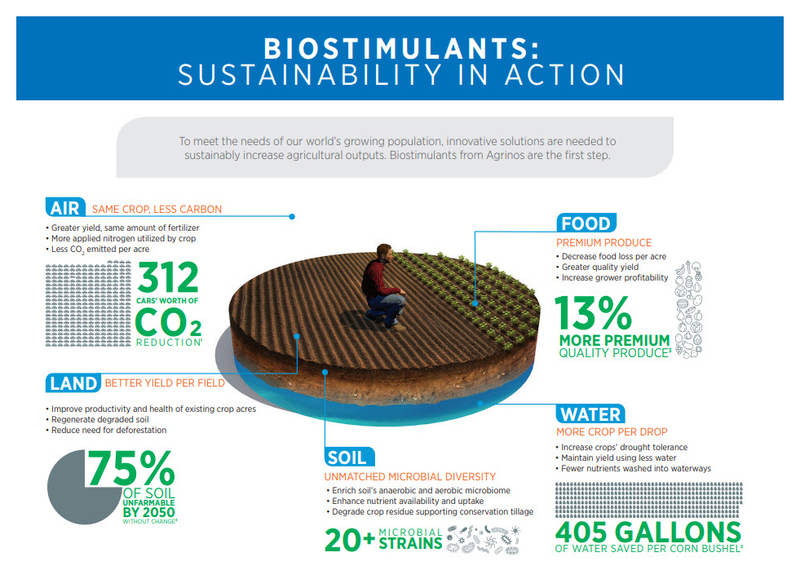 Click on the image below to learn more about the sustainability benefits of Agrinos' proprietary High Yield Technology biostimulants. Agriculture plays a pivotal role in sustainability, and society expects organizations like Agrinos to do their part. Count on Agrinos to lead the way. Agrinos is a member of The Sustainability Consortium, Cool Farm Alliance, Biostimulant Coalition, European Biostimulants Industry Council and Biological Products Industry Alliance. Find the product that works best with your crop.